In Defense of Food | Say what, Michael Pollan? When Prout and Liebig nailed down the macronutrients, scientists figured that they now understood the nature of food and what the body needed from it. Then when the vitamins were isolated a few decades later, scientists thought, okay, now we really understand food and what the body needs for its health; and today it’s the polyphenols and carotenoids that seem to have completed the picture. One has to wonder, if the scientists have long been so confident in the completeness of their understanding of human nutrition, why do they continue researching the subject? It is true that scientists have sometimes expressed undue confidence in an idea. However, the suggestion that nutrition scientists see human nutrition as a solved problem is patently absurd. These scientists continue doing research precisely because they understand that there are many questions remaing about nutrition. It is not now possible, and may never be possible, to specify a diet that would protect everyone against all forms of cancer. Nevertheless, the committee believes that it is possible on the basis of current evidence to formulate interim dietary guidelines that are both consistent with good nutritional practices and likely to reduce the risk of cancer. The authors of the report thus readily acknowledged that they didn’t “really understand food.” They issued guidelines anyway on the belief that useful recommendations could be made based on what they did understand. Even if we accept the epidemic of obesity and diabetes as the unintended consequence of the war against dietary fat–collateral damage, you might say–what about the intended consequence of that campaign: the reduction of heart disease? Here is where the low-fat campaigners have chosen to make their last stand, pointing proudly to the fact that after peaking in the late sixties, deaths from heart disease fell dramatically in America, a 50 percent decline since 1969. Cholesterol levels have also fallen. Epidemiologist Walter C. Willett of the Harvard School of Public Health…cites the increase in consumption of polyunsaturated fats “as a major factor, if not the most important factor, in the decline in heart disease” observed in the seventies and eighties… And so it would appear to be: We reduced our saturated fat intake, our cholesterol levels fell, and many fewer people dropped dead of heart attacks. The referenced study is “Trends in the Incidence of Myocardial Infarction and in Mortality Due to Coronary Heart Disease, 1987 to 1994.” As the title suggests, this “ten-year study” is actually an eight-year study. That means that Pollan is attempting to debunk claims made about health trends over the course of a few decades by looking at a much shorter period. Moreover, Walter Willett’s claim applies specifically to the seventies and eighties, but a reader who did not bother to check the references would not realize that the period under consideration by Pollan’s “ten-year study” actually only had three years in common with this interval. This becomes even more problematic when we look at what people were eating. Specifically, let’s look at the amount of polyunsaturated fats in the US food supply (page 65), which is most directly relevant to Willett’s claim. Amount of polyunsaturated fat in the US food supply, per capita per day. The red lines indicate the beginning and end of the period considered by the NEJM study. 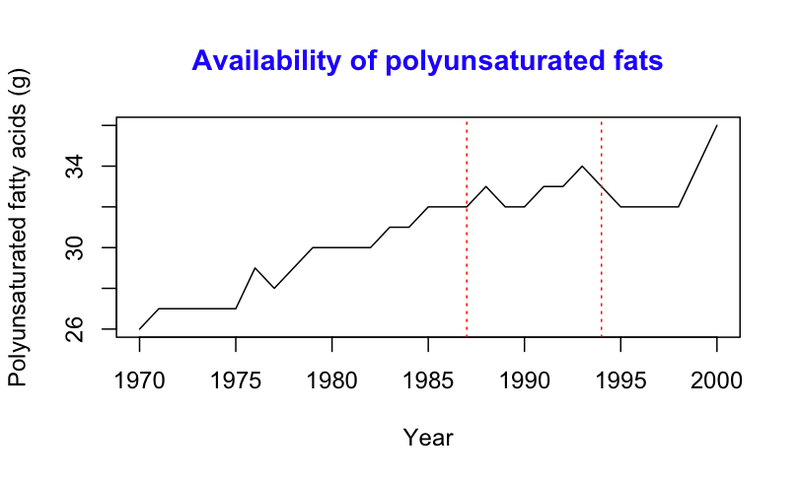 The data show that consumption of polyunsaturated fats increased from 26 grams per person per day in 1970 to 32 grams per person per day in 1985, with most of the increase coming from 1977 and 1985. However, in 1985 polyunsaturated fat intake more or less leveled out, and the net increase over the period under consideration in the NEJM study was only 1 gram. Thus, even if we were to suppose that Willett were right, it’s not clear that we should have expected to see much of a drop in the incidence of heart disease in the study. Since dietary changes can have long-term effects on health, this doesn’t necessarily mean that Pollan’s argument is completely wrong. Indeed, the distinction he makes between incidence of heart disease and deaths due to heart disease is an important one. However, it’s just not clear how relevant the study he cites really is. The choice of intervals needs to be justified as a part of his argument, rather than hidden away in the references.